In many high voltage applications corona is an unwanted side effect. Corona discharge from high voltage electric power transmission lines constitutes an economically significant waste of energy for utilities. In high voltage equipment like Cathode Ray Tube televisions, radio transmitters, X-ray machines and particle accelerators the current leakage caused by coronas can constitute an unwanted load on the circuit. In air, coronas generate gases such as ozone (O3) and nitric oxide (NO), and in turn nitrogen dioxide (NO2), and thus nitric acid (HNO3) if water vapor is present. These gases are corrosive and can degrade and embrittle nearby materials, and are also toxic to humans and the environment. Corona discharges can often be suppressed by improved insulation, corona rings, and making high voltage electrodes in smooth rounded shapes. However, controlled corona discharges are used in a variety of processes such as air filtration, photocopiers and ozone generators. 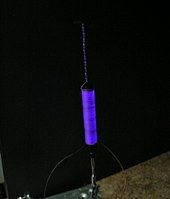 A corona discharge is a process by which a current flows from an electrode with a high potential into a neutral fluid, usually air, by ionizing that fluid so as to create a region of plasma around the electrode. 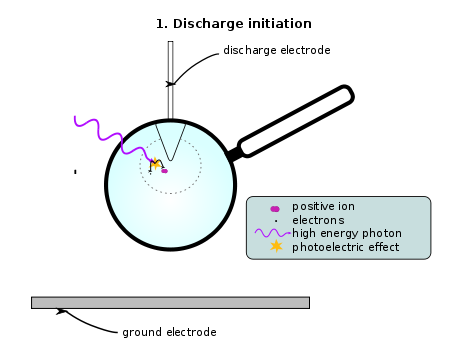 The ions generated eventually pass charge to nearby areas of lower potential, or recombine to form neutral gas molecules. 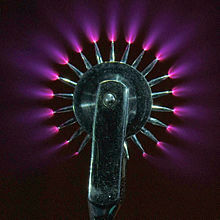 Along with the similar brush discharge, the corona is often called a "single-electrode discharge", as opposed to a "two-electrode discharge"; an electric arc. A corona only forms when the conductor is widely enough separated from conductors at opposite potential that an arc cannot jump between them. If the geometry and gradient are such that the ionized region continues to grow until it reaches another conductor at a lower potential, a low resistance conductive path between the two will be formed, resulting in an electric spark or electric arc, depending upon the source of the electric field. If the source continues to supply current, a spark will evolve into a continuous discharge called an arc. ^ a b Kaiser, Kenneth L. (2005). Electrostatic Discharge. CRC Press. pp. 2.73–2.75. ISBN 978-0849371882. ^ a b Hurley, Morgan J.; Gottuk, Daniel T.; Hall, John R. Jr. (2015). SFPE Handbook of Fire Protection Engineering. Springer. p. 683. ISBN 978-1493925650. ^ Lüttgens, Günter; Lüttgens, Sylvia; Schubert, Wolfgang (2017). Static Electricity: Understanding, Controlling, Applying. John Wiley and Sons. p. 94. ISBN 978-3527341283. ^ Fridman, Alexander; Kennedy, Lawrence A. (2004). Plasma Physics and Engineering. CRC Press. p. 560. ISBN 978-1560328483. ^ "Animals see power lines as glowing, flashing bands, research reveals". 12 March 2014. ^ "Vishay Offers C-stability in X2 Capacitors". CapacitorIndustry.com. 14 June 2012. Retrieved 2017-11-22. ^ Loeb, Leonard Benedict (1965). 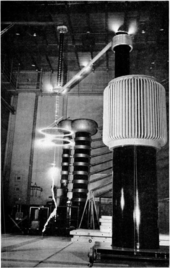 Electrical Coronas. University of California Press. pp. 406–409.